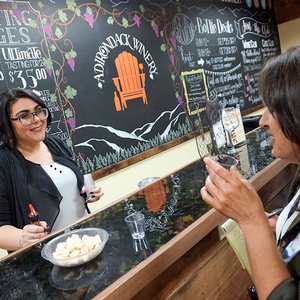 Visit Adirondack Winery Year Round! *FEATURING ONLY OUR NEW YORK WINE SELECTION! *We're OPEN Easter Sunday from 11am-5pm! Stop by while the family is in town! Our Tasting Room is located right on Canada Street/Rte 9 in downtown Lake George Village. We are on the north end of the strip, just before the corner of Amherst Street, right across from Shepard Park's Amphitheatre. The Tasting Room is located between LG Olive Oil Co and Ali Baba's. 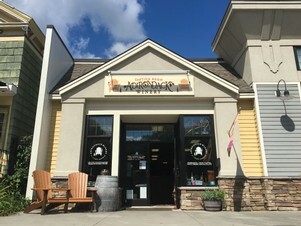 Adirondack Winery does not have a parking lot, but ample parking is available on many Lake George streets or in parking lots located within easy walking distance to our store. Please note that parking meters are installed on most spots. During the off-season, some parking meters may be turned off (please contact Lake George Village office for more info). CLICK HERE for more information on parking in Lake George Village. Our Bolton Landing Tasting Room is open early this year! Come visit us on Saturdays in April for a more intimate wine tasting experience in beautiful Bolton Landing! Hours are as follows. *Note: This space is also available for parties and speical events. Please contact us via email to inquire. Our Tasting Room is located right on Lake Shore Drive in downtown Bolton Landing. We are on the north end of town, just before the turn for the Sagamore Hotel, across the street from Tops. The Tasting Room is located between Palazzo's Pizzeria and Bob's Ice Cream. Adirondack Winery does not have a parking lot, but ample parking is available on many Bolton Landing streets or in parking lots located within easy walking distance to our store. NOTE: Please DO NOT park in the Tops parking lot across the street, the lot is reserved for Tops customers only. Thank you. OPEN FOR PICK-UP ORDERS & WALK-IN SALES! *ALL WINES are available to purchase at this location. Wine Pick-Up by appointment outside of these hours is available. Please call (518) 668-9463 to place your order or schedule a pick-up time. 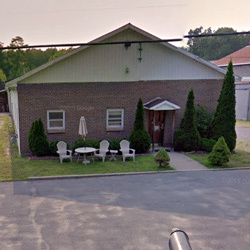 Our Winery Production facility is located in Queensbury, NY off Northway exit 18. When exiting the Northway, head west towards West Mountain. Make a left at the light at Stewart's Shop (Big Bay Road). Our facility is located approximately 0.5 miles down the road on the right hand side — small brick-faced building.